Location. 42° 35.821′ N, 74° 19.982′ W. Marker is in Middleburgh, New York, in Schoharie County. Marker is on Main Street, on the right. Touch for map. Marker is in front of Middleburgh High School. Marker is in this post office area: Middleburgh NY 12122, United States of America. Touch for directions. Other nearby markers. At least 8 other markers are within 2 miles of this marker, measured as the crow flies. 1st Reformed Church (approx. 0.2 miles away); Hon. Jonathan Danforth Home (approx. half a mile away); Site of Middle Fort (approx. 0.6 miles away); a different marker also named Site of Middle Fort (approx. 0.7 miles away); Burial Place (approx. 0.8 miles away); Indian Village (approx. 1.2 miles away); Smoke Generator (approx. 1.4 miles away); Vroman's Land (approx. 1½ miles away). Touch for a list and map of all markers in Middleburgh. 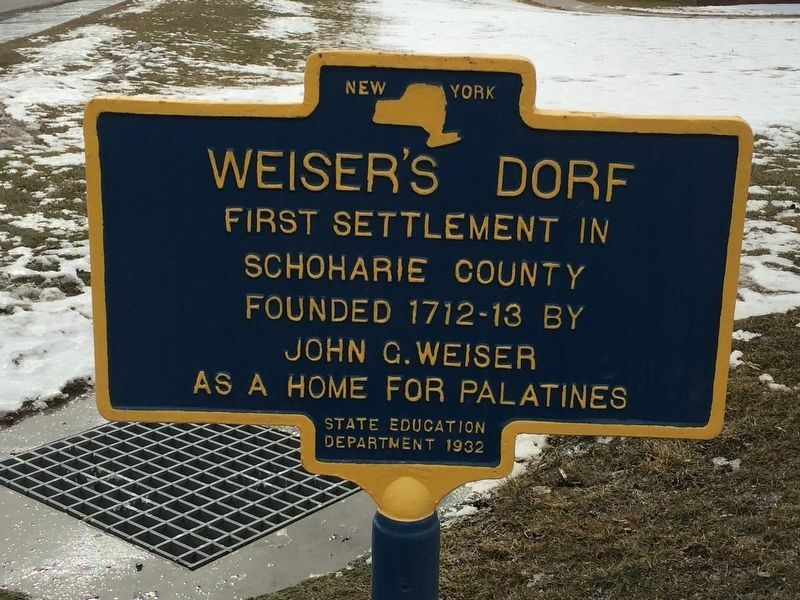 Regarding Weiser's Dorf. The German Palatines were early 18th-century emigrants from the Middle Rhine region of the Holy Roman Empire, including a minority from the Palatinate which gave its name to the entire group. They were both Protestant and Catholic. Towards the end of the 17th century and into the 18th, the wealthy region was repeatedly invaded by French troops, which resulted in continuous military requisitions, widespread devastation and famine. The "Poor Palatines" were some 13,000 Germans who migrated to England between May and November 1709. Their arrival in England, and the inability of the British Government to integrate them, caused a highly politicized debate over the merits of immigration. The English tried to settle them in England, Ireland and the Colonies. The Palatine settlements did not prove to be viable in the long term, except for those settled in County Limerick and County Wexford in Ireland and in the colony of New York. More. Search the internet for Weiser's Dorf. Credits. This page was last revised on February 26, 2019. This page originally submitted on February 24, 2019, by Steve Stoessel of Niskayuna, New York. This page has been viewed 12 times since then. Photo 1. submitted on February 24, 2019, by Steve Stoessel of Niskayuna, New York. • Bill Pfingsten was the editor who published this page.